Jean-Michel Basquiat was an influential African-American artist who rose to success during the 1980s. Basquiat’s paintings are largely responsible for elevating graffiti artists into the realm of the New York gallery scene., his spray-painted crowns and scribbled words, referenced everything from his Haitian and Puerto Rican heritage, to political issues, pop-culture icons, and Biblical verse. The gestural marks and expressive nature of his work not only aligned him with the street art of Keith Haring and Kenny Scharf, but also the Neo-Expressionists Julian Schnabel and David Salle. “If you wanna talk about influence, man, then you've got to realize that influence is not influence,” he said of his process. “It's simply someone's idea going through my new mind.” Born on December 22, 1960 in Brooklyn, NY, Basquiat never finished high school but developed an appreciation for art as a youth, from his many visits to the Brooklyn Museum of Art with his mother. His early work consisted of spray painting buildings and trains in downtown New York alongside his friend Al Diaz. The artist’s tag was the now infamous pseudonym SAMO. After quickly rising to fame in the early 1980s, Basquiat was befriended by many celebrities and artists, including Andy Warhol, with whom he made several collaborative works. At only 27, his troubles with fame and drug addiction led to his tragic death from an overdose on August 12, 1988 in New York, NY. The Whitney Museum of American Art held the artist’s first retrospective from October 1992 to February 1993. In 2017, after having set Basquiat’s auction record the previous year with a $57.3 million purchase, the Japanese billionaire Yusaku Maezawa surpassed it, buying the artist’s Untitled (1982) at Sotheby's for $110.5 million. This set a new record for the highest price ever paid at auction for an American artist's work. Today, Basquiat's works are held in the collections of The Museum of Modern Art in New York, the Rubell Family Collection in Miami, and the Museum of Contemporary Art in Los Angeles, among others. 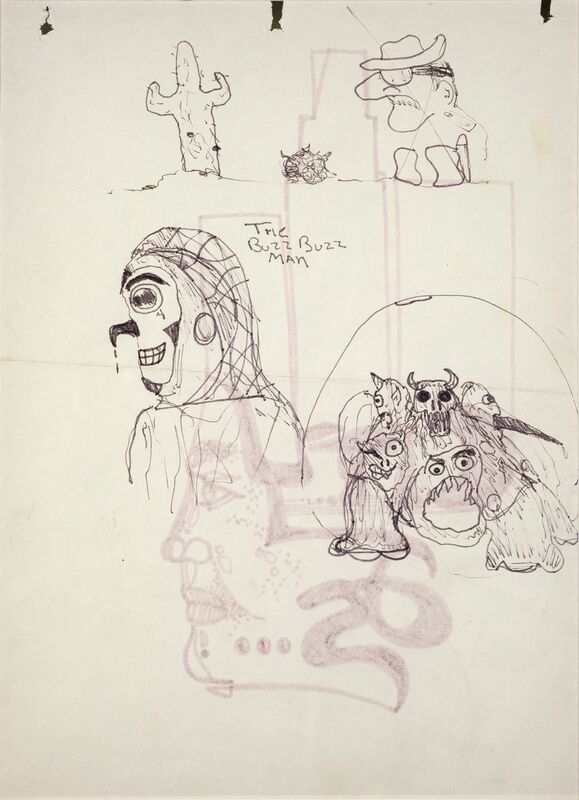 Detour Gallery is thrilled to announce our historic acquisition of “The Buzz Buzz Man” a marker and pen and ink on paper by the extraordinary twentieth-century artist, Jean Michel Basquiat. 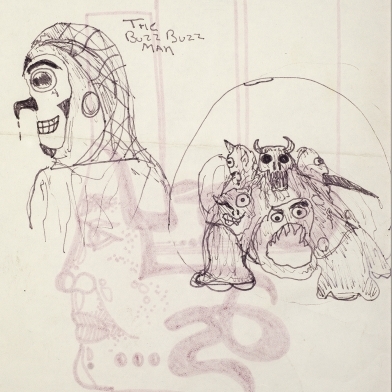 Created circa 1976 by the boisterous teenager while enrolled at City as School, “The Buzz Buzz Man” features a school tag on one side and three figures on the other. Amongst these three figures, we find the creative seed of his Untitled, 1982, which sold at auction for 57 million dollars in 2016.